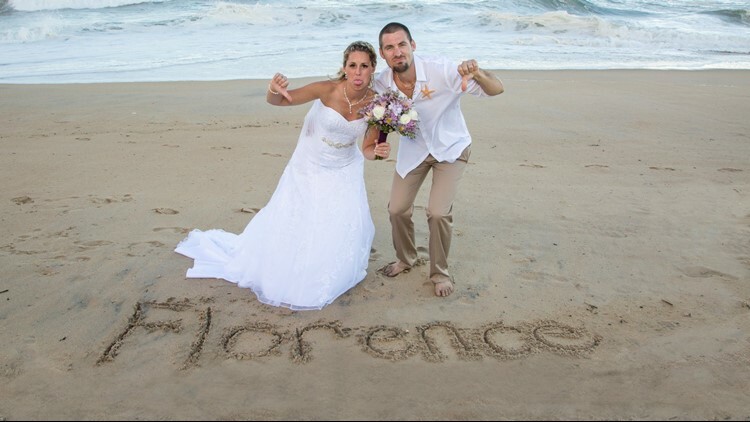 A mandatory evacuation of the Outer Banks because of Hurricane Florence forced a bride and groom to move up their wedding day. Leah and Brandon Frick were supposed to get married on the Outer Banks on Friday, but Hurricane Florence diverted their plans. The Pennsylvania couple went down to the Outer Banks on Sunday for a week-long wedding trip, which was cut short due to a mandatory evacuation. On Monday at 10 a.m., their wedding planner told them they needed to have the wedding now, or they wouldn't be able to take their vows until the following Monday. According to Leah, they didn't even have their wedding license yet. "I was in shock on Monday. I was just numb. I needed to put together a wedding. Luckily, everybody came together to help put it together," Leah Frick said. In seven hours, Leah and Brandon along with their family threw together a wedding and reception so they could be married before evacuating on Tuesday. Leah said she was surprised at how smoothly everything went. The caterer, the florist, the DJ, and everyone else was able to put the wedding together last minute. The only person who didn't have a free schedule was Leah's hairdresser. "From not knowing to knowing that my wedding was that day, the whole experience, just everything was perfect," Leah said. "I got married on the beach with perfect weather." The only downside about the pushed-up wedding date was two bridesmaids and groomsmen weren't able to make it. They all had plans to head down to the Outer Banks on Tuesday. Originally, the wedding was expected to be an 85-person wedding, but not everyone was able to make it last-minute.